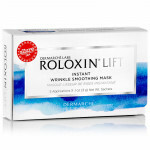 Roloxin® Lift's breakthrough, patented formulation combines a matrix of hydrophilic and hydrophobic silica particles that are deposited on the skin during the 7-minute treatment. The network of silica particles contracts as the skin dries to instantly create a bright, smooth, luminous appearance-with full results visible after just one treatment. Results last up to 24 hours. 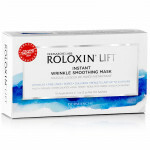 Roloxin Lift can be paired with all beauty routines to instantly improve facial texture, reduce the appearance of wrinkles and pores, and prep the skin for flawless makeup application. Finally, a safe and easy way to achieve a younger looking complexion in minutes. Awards: Winner allure Breakthrough Beauty Award, Earned Good Housekeeping Seal. holy grail mask that when used i see immediate results. skin is smoother, lines are diminished, pores are smaller, and skin tone is more even. this mask set is an absolute must have!! i use this mask once a week. i see results immediately. my skin looks firmer and smoother. this stuff really works! the results from this after using it once were jaw dropping. skin instantly felt smoother and firmer. i think this is definitely worth the money. This mask did nothing but dry out my face completely. No lifting, just stripped of any form of hydration. I would not recommend this to anyone with sensitive nor dry skin! Love Roloxin Lift. It is basically an instant face lift mask. After washing off the mask my skin is magically lifted!! Wow.